Fiesta red P type bass, based on a late ‘62 example. 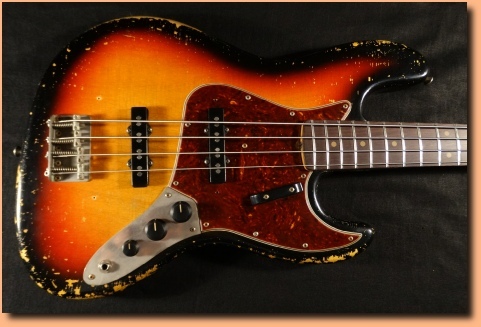 The bass features an alder body, veneer type rosewood fingerboard on maple neck, clay dots, and medium frets. Authentic vintage style hardware throughout, reverse tuners, threaded saddle bridge, etc. Bare Knuckle pickup wired through CTS pots and a Switchcraft jack socket. 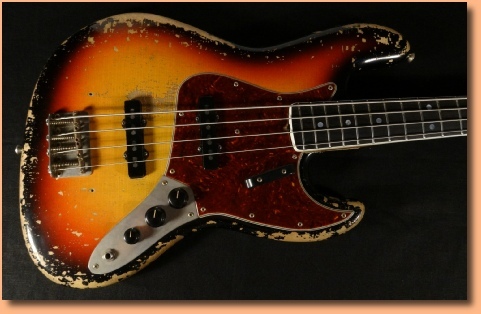 1966 style J type bass, finished in an incredibly authentic heavily distressed three tone nitro-cellulose sunburst. 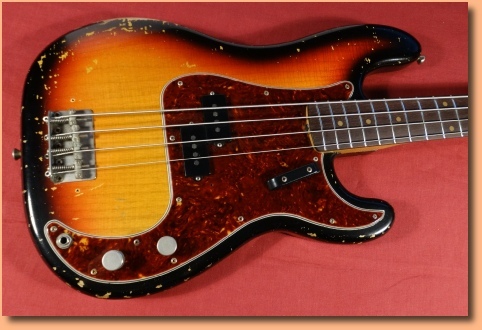 Dots and binding neck, pretty much unique to ‘66, the bass also features ‘lollipop’ tuners, 4 ply celluloid torty pickguard, Bakelite knobs and a gorgeous dark rosewood fingerboard with pearloid dot markers. Alder body with maple neck and curved join rosewood fingerboard with clay dots. Nitro-celluloid 4 ply pickguard, featuring the correct 30 degree bevelled edge. Vintage style hardware throughout, reverse tuners, threaded barrel type bridge. 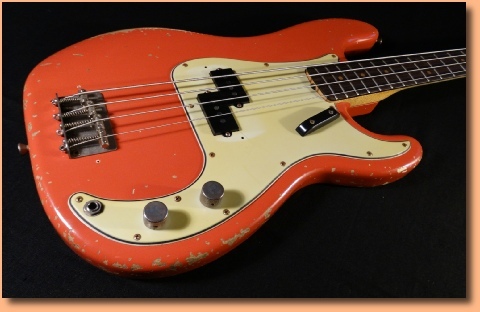 ‘63 style J Type bass, alder body finished in three tone sunburst, maple neck with curved join rosewood fingerboard. Plenty of authentic looking wear and tear, plays and look great,, sounds like a good J should...growling and tight. 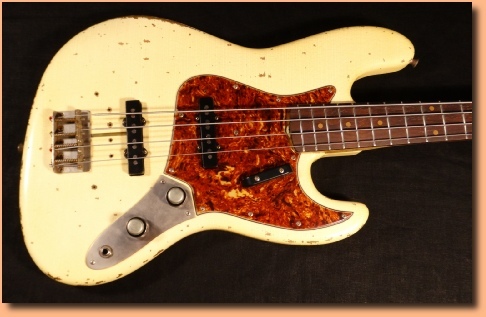 ‘58 style P type bass, swamp ash body finished in a cool distressed blonde finish. Maple one piece neck with ‘A’ width nut. Anodised guard, vintage correct hardware throughout, including ‘58 style bridge with finer threading on saddles. Bare Knuckle ‘58 P pickup, CTS pots and Sprague orange drop capacitor. 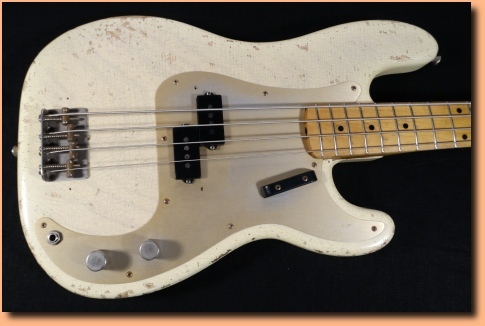 Very cool recreation of a 1960 stack knob J type bass, finished in Olympic White with moderate distressing. Alder body with maple neck with slab board rosewood fingerboard. 7.5” radius fingerboard with medium frets. Bare Knuckle HF60 pickups wired through CTS dual concentric pots gives the bass a broad sonic scope.